We’re big on ethics. We even wrote the book on ethical marketing. So when we read that Ikea was one of several companies contributing to landfill, due to their cardboard packaging, we decided to do something positive about it. Instead of trying to make customers feel guilty, “Recycle or the planet gets it!” we decided to engage them in a solution – UPP CYKEL. It was inspired by a simple act – we bought a new bin for the office. It came in a large cardboard box. Which was ironically going to end up in the bin and maybe landfill. We created UPP CYKEL, an idea we think any company using a lot of packaging like IKEA, Amazon and electrical goods manufacturers could use. We print different cut out templates on the cardboard box. You unpack your bookcase, and assemble it. You then cut out the template of a storage box and assemble it. Now you put that in your bookcase. Useful. 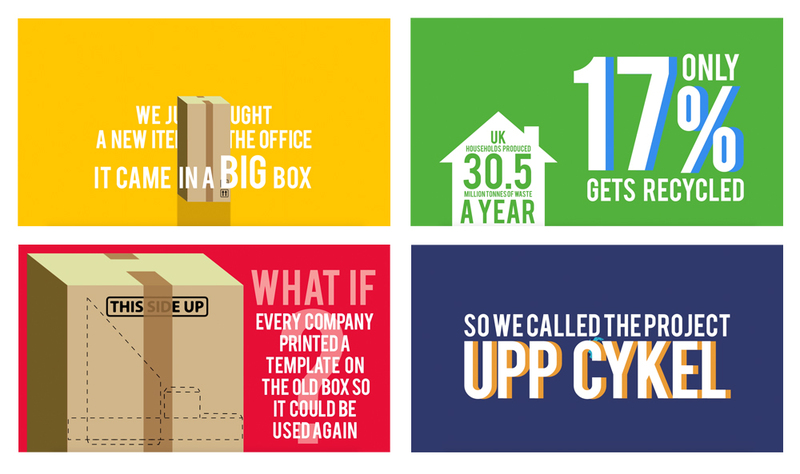 70% of the cardboard has been ‘upp cyckeled’. Everyone is happy. And it’s a sustainable idea because you can just keep inventing new template ideas – we already have over 40.